Apple have approved mobileAgent 1.4 today. It's the release I've wanted to do for a while, but until recently, not had the time (or working internet connection) to complete. 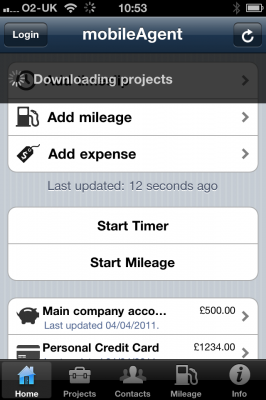 The main new feature is the attaching of expense receipt images to an expense. 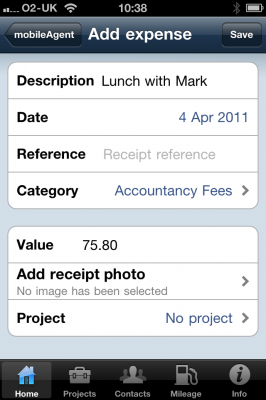 This allows you to take a photo of your receipt, and push it into FreeAgent as soon as you do the expense - no more putting them into a shoe box and (maybe) scanning them later. Remember, however, that you MAY need to keep all those tiny pieces of paper. HMRC (and most other tax collectors) often require you to keep the originals for a set period of time, usually 7 years. But at least you can find the image easily not, and then say "it's in that box over there". The upload process has been done in a way that if the upload fails, it will fail fairly gracefully. The process is two step. The first step is making a new Expense. This is the same as before. 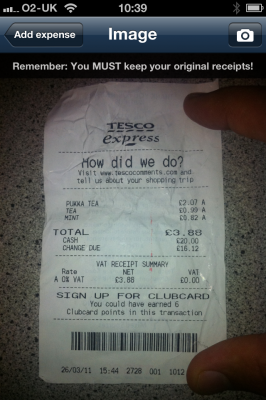 After that, the image is attached to that expense. If the first part works but the second fails (which can happen on a slow or flaky connection), mobileAgent will not try to make the initial expense again - it will just attach the image. This way, you can be sure that for every expense you enter, you only end up with one expense in FreeAgent, even if one or more parts of the upload stage fails. The login and syncing process has been given some love, as it was going off into lala land for a while with no user feedback. It's not fully on a background thread, which means the UI will stay responsive while it's off doing things. It's also visually updated, and, I think, looks a lot better. The bank account detail screen now has the balance. If you have more than 20 contacts, you can search for them using a normal iPhone search box. The default reclaim rate for a vehicle is now 0.45, which is inline with the updated HMRC guidelines. This does not change any existing vehicles you have setup, only new ones, and as always, you can change this to whatever value you need. Development on this release was cut short, as I wanted to get the expense receipt photo feature out as soon as possible - a lot of people have been "demanding" it for a long time. I have some more updates in the pipeline, but this is the last major feature I wanted to add - mobileAgent is now how I'd envisioned it when I started it in the middle of last year. That doesn't mean I'm finished - just means I've gotten to where I wanted to be. As usual, the goalposts have moved, so there is always more to add!